Want tosave 1,45 kn on this order and become Loyalty program member? 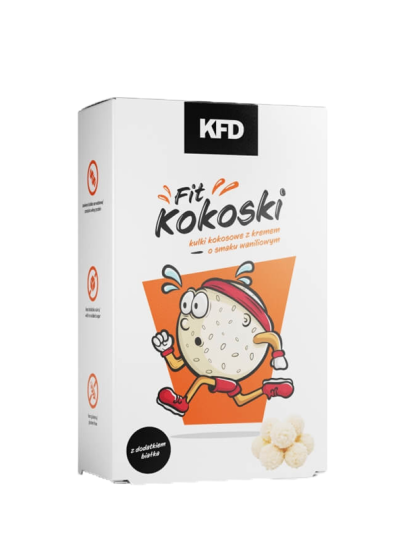 Coconut balls are an excellent solution for those who love coconut power balls and all those who love healthy candies without added sugar. Enriched with whey protein and isolates, they are a delight to all health-conscious candy lovers. Vanilla flavor cream 52% (non-hydrogenated vegetable fat, whey protein concentrate 11%, sweetener (maltite), aroma, acidity regulator (malic acid), color (carotenes), 20% (milk) 2%, corn flour , rice starch), 18% mainly (non-hydrogenated vegetable fat, sweetener (maltitol), whey protein concentrate (milk) 2%, acidity regulator (apple acid)), 10% coconut flakes. Contains a sweetener. Increased consumption can cause laxative effect.